S Martha, U Veldandi, K Devarakonda, N Pantam, S Thungathurthi. Role of IGF-I in aspirin pretreatment in streptozotocin induced type-II diabetic rats. The Internet Journal of Pharmacology. 2008 Volume 6 Number 2. In the present study, we made an attempt to investigate role of insulin like growth factor-I (IGF-I) in aspirin pretreatment in streptozotocin induced type-2 diabetes mellitus in rats. Rat pups were divided in to four groups, on 5th day of their birth, group-I pups were received citrate buffer solution served as normal, group-II were treated only with streptozotocin (80mg/kg, i.p) served as diabetic, group-III & group-IV were treated with aspirin (10mg/kg/day, p.o) for one month (5-35 days) and two month (5-65) after streptozotocin served as treated groups. On 36 and 66 day, blood samples were collected from all animals and fasting blood sugar, fasting insulin, IGF-I, insulin resistance and insulin sensitivity levels were estimated. Results of 36 & 66 days blood samples of pups treated with streptozotocin alone and in combination with aspirin for one month and two months were shown significantly raised body weight, fasting blood glucose and insulin resistance levels (P=0.0005, p<.0001, p<.0001, P=0.0006, p<.0001, P=0.0030) and significantly lowered fasting insulin and insulin sensitivity levels when compared to the normal control pups (p<.0001, p<.0001, p<.0001, p<.0001, p<.0001, P=0.0068) respectively. Pups treated with aspirin for one month were shown significantly raised IGF-I levels but two months treatment were shown significantly lowered IGF-I levels when compared to the normal pups (p<.0001). The present study indicates that aspirin pretreatment seems to protect pancreas from damage caused by STZ and maintains glucose levels in diabetic rats and increases insulin sensitivity and reduces insulin resistance, this may a involvement of insulin like pathway particularly IGF-I. Type-2 diabetes mellitus is a metabolic disorder with characteristics of hyperglycemia and insufficiency of secretion or action of endogenous insulin . Insulin resistance is one of the major characteristics of type 2 diabetes mellitus. If the insulin resistance can result from oxidative damage, then a prediction would be that chronic oxidative stress would lead to hyperinsulinaemia if plasma glucose is clamped at normal level by infusing the required insulin. Increased oxidative stress, defined as a persistent imbalance between the production of highly reactive molecular species (chiefly oxygen and nitrogen) and antioxidant defenses, is a widely accepted participant in the development and progression of diabetes and its complications . Hyperglycemia was also found to promote lipid peroxidation of low density lipoprotein (LDL) by a superoxide-dependent pathway to generate free radicals . Free radicals can be generated in glucose oxidation, which is believed to be the main source of free radicals, which are not degraded by catalase or glutathione peroxidase, and in the presence of transitional metals, can lead to production of extremely reactive hydroxyl radicals . Aspirin is a derivative of salicylic acid, used as a NSAID, anti thrombotic, antioxidant and anti diabetic drug has new approach in type2 diabetes. Salicylates inhibit serine/ threonine caused insulin resistance and IKK-β activity and restore insulin sensitivity, both in-vitro and in vivo. Salicylate alters the phosphorylation patterns of IRS proteins, resulting in the decrease serine phosphorylation, increased tyrosine phosphorylation, and improved insulin action . The principal mechanism of action of aspirin for its pharmacological actions is inhibition of arachidonate cyclooxygenase . Cyclooxygenase (COX) is of two types namely COX-I & COX-II. COX-I is a constitutive enzyme expressed in most tissues including blood platelets and is involved in cell-cell signaling and tissue homeostasis. COX-II is induced in inflammatory cells when they are activated and is believed to be the enzyme that produces the prostanoid mediators of inflammation. Aspirin and also most of the non-steroidal anti inflammatory drugs (NSAIDS) in current use are inhibitors of both isoenzymes (COX-I &COX-II), though they vary in the degree of inhibition of each . Many of the antioxidants have the capability of decreasing the blood sugar levels. Free radicals play a major role in most of the diabetes and cardiovascular diseases. Aspirin with its antioxidant properties is considered to be beneficial in such disorders . The insulin-like growth factor 1 (IGF1), insulin-like growth factor binding protein 3 (IGFBP3), insulin receptor substrate 1 (IRS1), insulin receptor substrate 2 (IRS2), and the vitamin D receptor (VDR) genes have been proposed as being directly or indirectly involved in insulin- related pathways. Polymorphisms of these genes have been identified, some of which have been shown to have effects on insulin resistance and/or colon cancer risk . In this study we make an attempt to investigate whether aspirin plays any important role in preventing type-II diabetes mellitus in relation to IGF-I in rats. In view of the above facts, aspirin having antioxidant, antidyslipidimic and anti diabetic properties. We made an attempt to investigate whether aspirin plays a role in preventing non insulin diabetes mellitus. Aspirin pure substance was a kind gift from Natco Pharma Limited, Hyderabad, India. Diphenyl picryl hydrazyl and streptozotocin were purchased from Sigma, St. Louis, USA. Glucose kit was purchased from Excel diagnostics limited, Hyderabad. Ethanol (analytical grade) purchased from E. Merck Limited, Mumbai, India. Four pregnant female Wistar rats, weighing between 300-350g were obtained from Mahaveer Enterprises, Hyderabad. The rats were housed individually in acrylic cages in standard environmental conditions (20-250C), fed with standard rodent diet and water ad libitum. The rats were delivered within 1-2 days. The experiments on animals were conducted in accordance with the internationally accepted principles for laboratory animal use. The experiment was planned after getting the approval from the Institutional animal ethical committee. On 8.00 AM, the rat Pups were received a single 80 mg/kg intraperitoneal injection of streptozotocin (Sigma, St. Louis, MO) in 0.1 M sodium citrate buffer, pH 4.5. Control nondiabetic animals were fasted and received citrate buffer alone. After 8th week, animals with blood glucose levels greater than 150 mg/dl were considered diabetic . All variables are expressed as means ± SD. Group differences of continuous variables were compared using ANOVA followed by Newman Keuls test. For all analyses, a P value < 0.05 was considered to be statistically significant. All analyses were performed using Graph Pad Prism 4 (Version. 4). Yaun et al., 2001 reported Salicylates inhibits IKK-B activity and restore insulin sensitivity, both invitro and invivo . Hundal et al., 2001 reported treatment of nine type 2 diabetic patients for 2 Weeks with high dosages of aspirin (7g/day) resulted in reduced hepatic glucose production and fasting hyperglycemia and increased insulin sensitivity . Micossi et al., 1947 reported aspirin stimulates insulin and glucagon secretion and increases glucose tolerance in normal and diabetic subjects . Seino et al., 1982 reported that acetyl salicylic acid (ASA) alleviates glucose intolerance in maturity onset diabetics by a direct enhancement of insulin secretion . Our present study also indicates that the aspirin treated for one month shown that significantly reduced blood glucose levels, significantly improved levels of insulin, significantly improved levels of insulin sensitivity and significantly lowered insulin resistance levels. There is a great deal of evidence that aspirin / NSAIDs have effects on insulin resistance. It has been long known that salicylates have a hypoglycemic effect and that they reduce fasting blood glucose in diabetic persons . High doses of salicylates have been shown to reverse hyperglycemia, hyperinsulinemia, and dyslipidemia in obese rodents by sensitizing insulin signaling . In patients with type 2 diabetes, aspirin treatment has been shown to reduce fasting plasma glucose, total cholesterol, C-reactive protein, triglycerides, and insulin clearance; aspirin reduced hepatic glucose production and improved insulin-stimulated peripheral glucose uptake by 20% . Aspirin/NSAID influence on insulin resistance appears to be independent of COX-2 inhibition, instead involving inhibition of nuclear factor-nB and InB and/or activation of peroxisome proliferator-activated receptors . An interaction between aspirin and IRS1 in antagonizing effects of tumor necrosis factor- α (TNF- α) has also been reported. TNF- α, a major cause of insulin resistance in obesity and inflammation, has been reported to inhibit insulin-induced glucose uptake by targeting components of the insulin signaling cascade, one of which is insulin receptor substrate . IRS1 is the major cytoplasmic substrate of the insulin receptor in most insulin sensitive tissues and is necessary for maintenance of metabolic homeostasis. Aspirin has been shown to inhibit the TNF- α-induced serine phosphorylation of IRS1 through inhibition of multiple serine kinases, including IB kinase . However, our findings are consistent with the animal studies demonstrating low insulin sensitivity in mice with liver specific deletion of the IGF-I gene that is reversed by treatment with recombinant human IGF-I  which was raised by the aspirin treatment for one and two months. IGF-I has hypoglycemic effects and enhances insulin sensitivity in both experimental and human subjects it is due to its type-1 receptors and / or hybrid insulin / IGF-I receptors . 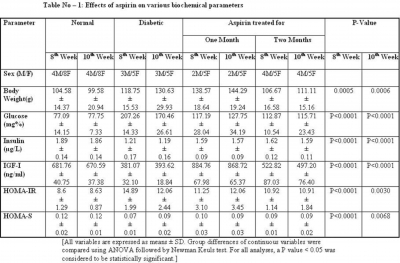 High levels of IGF-I in one month treated aspirin group when compared to two month treated group, is important to note that short term therapy seems to be beneficial. Preconditioning of hepatocytes with aspirin on short course is better than long term treatment in production of IGF-I. Mechanism of increased levels of IGF-I in one month aspirin treated group is not well understood. In conclusion, the present study indicates that aspirin pretreatment seems to protect pancreas from damage caused by STZ and maintains glucose levels in diabetic rats and increases insulin sensitivity and reduces insulin resistance. The protection offered by the aspirin treatment in type -2 diabetes, there may a involvement of insulin like pathway particularly IGF-I. The mechanism of increased levels of IGF-I in one month treated group when compared to two month treated group is not well understood and further studies are required to prove this hypothesis. 1. Kataoka S, Satoh J, Fujiya H, Toyota T, Suzuki R, Itoh K, Kumagai K. Immunological aspects of the nonobese diabetic (NOD) mouse. Abnormalities of cellular immunity. Diabetes 1983; 32: 247-253. 2. Ceriello A. Oxidative stress and glycemic regulation. Metab 2000; 49: 27-29. 3. Tsai EC, Hirsch IB, Brunzell JD, Chait A. Reduced plasma peroxyl radical trapping capacity and increased susceptibility of LDL to oxidation in poorly controlled IDDM. Diabetes 1994; 43: 1010-1014. 4. Jiang ZY, Wollard AC, Wolff SP. Hydorgen peroxide production during experimental protein glycation. FEBS Lett 1990; 268: 69-71. 5. Yaun M, Konstantopoulos N, Lee J, Hansen L, Li ZW, Kirin M, Shoelson SE. Reversal of obesity and Diet-induced insulin resistance with salicylates or targeted disruption of IKK B. Science 2001; 293: 1673-1677. 6. Vane JR. Inhibition of prostaglandin synthesis as a mechanism of action for aspirin-like drugs. Nature New Biology 1971; 231: 232-235. 7. Gierse James K, McDonald Joseph J, Hauser Scott D, Rangwala Shaukat H, Koboldt Carol M, Seibert Karen. A single amino acid differences between cyclooxygenase-1 (COX-1) and -2 (COX-2) reverses the selectivity of COX-2 specific inhibitor. The Journal of Biological Chemistry 1996; 271: 15810-15814. 8. Burak Pamukcu. Review of aspirin resistance; definition, possible mechanisms, detection with platelet function tests, and its clinical outcomes. Journal of Thrombosis and Thrombolysis 2007; 23: 3. 9. Rosen CJ, Kurland ES, Vereault D, et al. Association between serum insulin growth factor-I (IGF-I) and a simple sequence repeat in IGF-I gene: implications for genetic studies of bone mineral density. J Clin Endocrinol Metab 1998; 83(7): 2286 – 90. 10. Arulmozhi DK, Veeranjaneyulu A, Bodhankar SL. Neonatal streptozotocin-induced rat model of Type 2 diabetes mellitus: A glance, Indian Journal of Pharmacology 2004; 36: 217-221. 11. Matthews DR, Hosker JP, Rudenski AS, Naylor BA, Treacher DF, Turner RC. Homeostasis model assessment: insulin resistance and β-cell function from fasting glucose and insulin concentrations in man. Diabetologia 1985; 28: 412-419. 12. Hundal RS, Mayerson AB, Peterson KF, Rife FS, Randhawa PS, Inzucchi SE, Shoelson SE, Shulman GI (2001). Potential for novel classes of insulin sensitizing agents by inhibition of IKKB activity. Diabetes (DOI): 50(Suppl.2); A117. 13. Micossi P, Pontiroli AE, Baron SH, Tamayo RC, Lengel F, Bevilacqua M, Raggi U, Norbiato G, Foa PP. Diabetes 1978; 27(12): 1196-1204. 14. Seino Y, Usami M, Nakahara H, Takemura J, Nishi S, Ishida H, Ikeda M, Imura H. Prostaglandins Leukot Med 1982; 8(1): 49-53. 15. Fang V, Foye WO, Robinson SM, Jenkins HJ. Hypoglycemic activity and chemical structure of the salicylates. J Pharm Sci 1968; 57(12): 2111 – 6. 16. Graef I, Gibbons DM. Salicylates and carbohydrate metabolism. Diabetes 1960; 9: 416 – 8. 17. Powell ED, Field RA. Studies on salicylates and complement in diabetes. Diabetes 1966; 15(10): 730 – 3. 18. McRae JR, Chen M, Robertson RP. 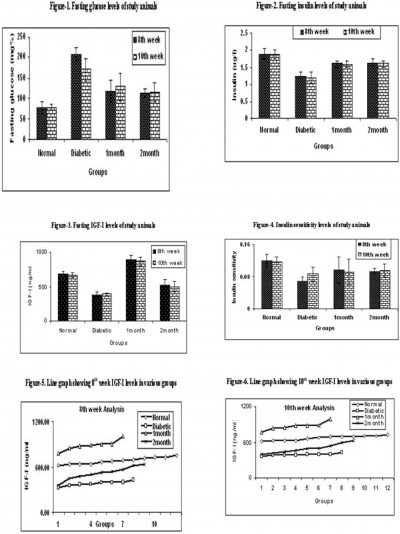 Improvement of defective insulin responses to glucose, arginine, and b-adrenergic stimulation in diabetics by sodium salicylate. Adv Prostaglandin Thromboxane Res 1980; 8: 1287 – 9. 19. Baron SH. Salicylates as hypoglycemic agents. Diabetes Care 1982; 5(1): 64 – 71. 20. Yuan M, Konstantopoulos N, Lee J, et al. Reversal of obesity- and diet-induced insulin resistance with salicylates or targeted disruption of IKKb. Science 2001; 293(5535):1673– 7. 21. Hundal RS, Petersen KF, Mayerson AB, et al. Mechanism by which high-dose aspirin improves glucose metabolism in type 2 diabetes. J Clin Invest 2002; 109(10): 1321 – 6. 22. Gao Z, Zuberi A, Quon MJ, Dong Z, Ye J. Aspirin inhibits serine phosphorylation of insulin receptor substrate 1 in tumor necrosis factor-treated cells through targeting multiple serine kinases. J Biol Chem 2003; 278(27): 24944 – 50. 23. Xu H, Hotamisligil GS. Signaling pathways utilized by tumor necrosis factor receptor 1 in adipocytes to suppress differentiation. FEBS Lett 2001; 506(2): 97 – 102. 24. Hotamisligil GS. The role of TNF-α and TNF receptors in obesity and insulin resistance. J Intern Med 1999; 245(6): 621 – 5. 25. Hotamisligil GS, Peraldi P, Budavari A, Ellis R, WhiteMF, Spiegelman BM. IRS-1-mediated inhibition of insulin receptor tyrosine kinase activity in TNF- α - and obesity-induced insulin resistance. Science 1996; 271(5249): 665 – 8. 26. Hofmann C, Lorenz K, Braithwaite SS, et al. Altered gene expression for tumor necrosis factor-A and its receptors during drug and dietary modulation of insulin resistance. Endocrinology 1994; 134 (1): 264 – 70. 27. Yakar S, Liu JL, Fernandez AM, Wu Y,Schally AV, Frystyk J, Chernausek SD, Mejia W, Le Roith D. Liver-specific IGF-1gene deletion leads to muscle insulin insensitivity. Diabetes 2001; 50: 1110–1118. 28. Sjogren K, Wallenius K, Liu JL, Bohlooly YM, Pacini G, Svensson L, Tornell J, Isaksson OGP, Ahre´n B, Jansson JO, Ohlsson C. Liver-derived IGF-I is of importancefor normal carbohydrate andlipid metabolism. Diabetes 2001; 50: 1539–1545. 29. Sesti G, Federici M, Lauro D, Sbraccia P, Lauro R. Molecular mechanism of insulin resistance in type 2 diabetes mellitus: role of the insulin receptor variant forms. Diabetes Metab Res Rev 2001; 17: 363–373. Clinical Research Division, Covedien Inc.